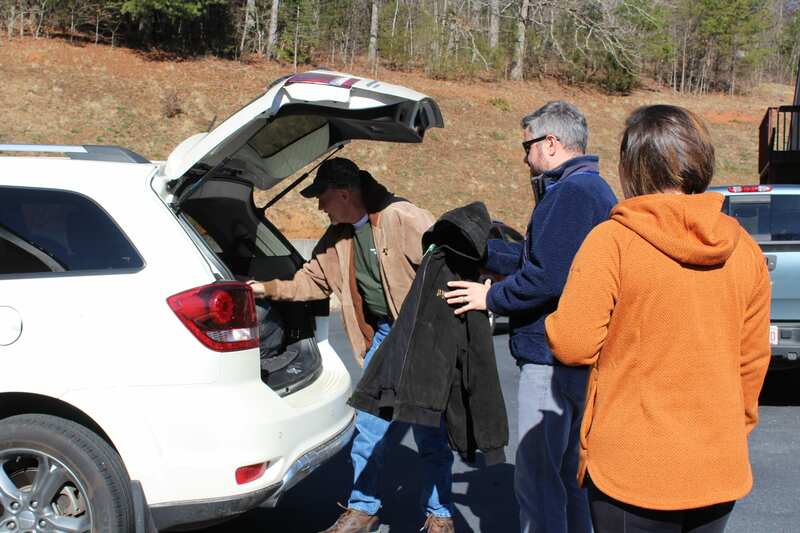 A steady stream of contributors meandered through the parking lot at Farm Bureau on Friday and throughout the weekend with folks bringing food, coats and blankets to fill the CareNet truck. 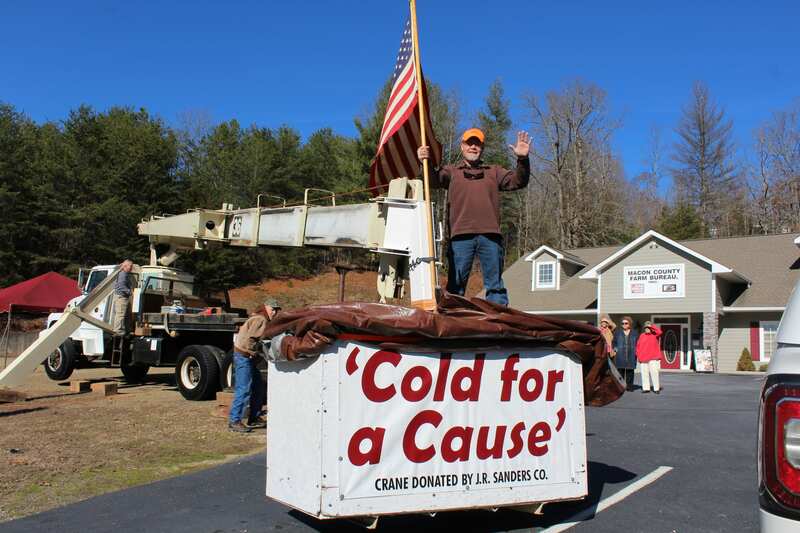 Sunshine and blue skies accompanied Patrick Jenkins’s final trip in a cherry picker’s bucket for his signature “Cold for a Cause” event Friday. His mom watched him go up for the 10th consecutive year at noon along with a half dozen others, before inclement weather hit Saturday around 3 p.m. – another tradition of the event that filled most of three CareNet box trucks with donations for needy families. 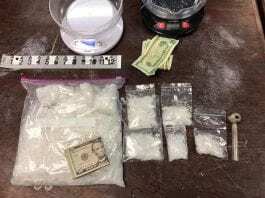 “She’s my rock,” Jenkins said of his 73-year-old mother, Joan Jenkins, who spends the weekend shuttling to and from the Farm Bureau insurance office on Highlands Road to make sure her son has enough orange juice, hot drinks, lunch and supper. Well-wishers visited throughout the day and weekend to drop off donations that benefited CareNet’s support to local families in the way of coats, blankets, canned foods and personal hygiene items. “We made about five runs to our hut to unload,” said CareNet Executive Director Tim Hogsed, 38, who along with warehouse manager Don Yurges started transferring donations back to the Bidwell Street warehouse Saturday morning. As of Tuesday afternoon, CareNet counted more than 6,000 pieces of clothing and blankets, and 6,820 lbs. of food and personal care products. 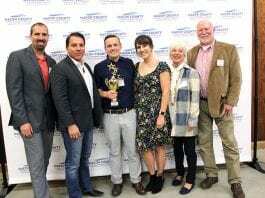 The charitable organization filled a 14’ box truck three-quarters of the way with food, and a 16’ box truck one and a half times with clothing and blankets. 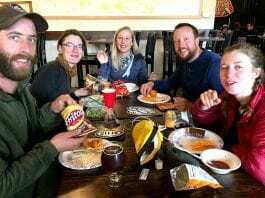 Hogsed said yearly contributions from Cold for a Cause represent 20 to 25 percent of the charitable organization’s annual intake. Twelve ninth graders from Victory Christian School in Sylva were on hand Tuesday to check expiration labels and help sort the food contributions. Another group of 10th to 12th grade volunteers will return Thursday to finish the job. While he avoided ice and snow this year, Jenkins faced near-continuous rain that began Saturday afternoon, increasing the dampness of the air and the “bone-chilling” cold, which hovered above freezing in the 30s. Extra blankets kept him warm, as did the sight of the same folks who have supported him for years. But it wasn’t always that way, the insurance agent turned philanthropist explained. Hogsed said the donations go to Macon County families in a crisis situation. Jenkins says the public’s response over the last 10 years has been nothing less than “overwhelming,” and he is eager to nurture, support and train a potential successor or successors. “We decided that we were going to sit down within the next week or two,” he said of an upcoming meeting with Hogsed, who envisions area churches or community leaders potentially rotating in the bucket role. Sunday afternoon after Jenkins got home and took a hot shower, he sat down to compose his last, lengthier Facebook post to supporters. In it he expressed the wish to support the event’s continuation.